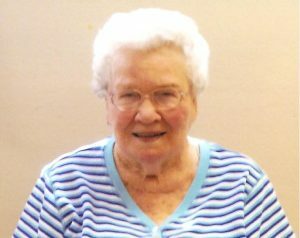 Irene Rasmussen, 97, of David City, died Sunday, April 2, 2017 at St. Joseph's Villa in David City. Funeral Service Saturday, April 8, 2017 11:00 A.M.
Visitation Friday April 7, 2017 5-8 P.M.
Irene was born March 28, 1920 in Seattle Washington to Theresa and Herbert Jaynes. She lived her childhood in Osborn, Idaho. As a teenager, the family moved to Oceanside, California where Irene and her family ran a Pacific Ocean beach camp. In 1940, her family moved to San Diego, California. In 1943 she met her husband Wilsie Rasmussen when he was stationed at a military base in California. They married in 1943 and travelled to various Army bases throughout the US as part of Wilsie’s military assignments. In 1947 after discharge from the Army Air Corp, Irene and Wilsie moved to Litchfield, Nebraska where Wilsie had grown up. They engaged in farming and in 1956 moved to Surprise, Nebraska where they continued to farm and be active in the community. Irene had a lifelong passion for books, maps and learning about new places. She cherished and thoroughly enjoyed travelling to the different bases during the years of Wilsie’s Army service. She instilled that passion in her children and taught them to explore the world whether through actual travel or reading about new places. She majored in journalism and kept diaries her whole life. She was the Surprise news reporter to the Banner Press for a few years. Besides reading and writing, in the 1960’s Irene drove the Surprise school bus, owned and ran the Surprise grocery store in the 1970’s, as well as assisting her husband in farming and raising her family. She had a love of all animals especially dogs. Irene thoroughly enjoyed playing board games, rummy, and practical jokes (especially on her children and grandchildren). She will be long remembered by her family for her love of knowledge and humor. She was a member of the Rising City United Methodist Church. Irene was preceded in death by her husband Wilsie who died in March 2005, her parents, her brothers Fred and Bill and sister Alice Evelyn. She will be mourned by her children; son Vern Rasmussen and wife Theresa of Alliance, Nebraska, daughter Susan Schooley and husband Leslie of Gresham, Nebraska, daughter Rebecca Rasmussen and spouse Gia Johnson of Punta Gorda, Florida and son Dan Rasmussen and wife Barbara of Surprise, Nebraska. She is also survived by six grandchildren, Daren and wife Sherry Rediger, Wendy and husband Mitch Stuhr, Amy and husband Mike Colerick, Mikklena and husband John Matthews, Ryan and wife JJ Rasmussen, and Dana Rasmussen as well as eleven great grandchildren Benjamin, Owen, Logan, Reese, Jack, Courtney, Grant, Garrett, Preston, Jaycee, and Averie. Kracl Funeral Chapel in David City is handling the services.